In this guide you're going to learn about all of the different types of casino offer from low risk to high risk. If you haven't already then please make sure you read the Risk Free Casino Offers guide as it explains the risk free bonuses and free spins you sometimes get. There are plenty of casino offers available every day for you but unfortunately not all of them are risk free. In fact, a large majority of the offers will require you to wager something first in order to unlock a bonus or free spins. Normally wagering your own money on the casino isn't a good idea, however the bonuses and spins that the casinos are offering make it worthwhile. The low risk offers are especially good for the Team Regular kind of person as there is little risk and you can make a few quid here and there. The high risk ones are obviously more risky and should only be attempted by people that have a good understanding of casino offers and a bigger bankroll. There's a lot to take in when reading this guide and so listed below are the key areas. There is also a summary at the end of the guide - if you understand that then you're pretty much all set to go! Before attempting the non risk free casino offers it's important that you understand variance. The thing with these casino offers is that you aren't guaranteed to win, and sometimes you might even lose money. This is called variance. The idea is that if you keep attempting profitable offers then over a long period of time your winnings will outweigh your losses and you'll be in profit. Each offer will have an "expected value" or "ev", which is the amount you'll expect to win each time you attempt the offer. Obviously you're not going to win exactly the same amount each time - if an offer is worth say £3 then you might make £5 one time, £2 another time, and lose £1 another time; the £3 value just indicates what you should be making in the long term. If you attempted that offer 100 times then you'd expect the variance to balance out and make around £300 overall (so £3 per offer on average). So how do you work out if an offer is profitable? And more importantly, how do you work out how much it's worth? It's actually really easy! All you need to do is calculate the EV (estimated value). EV (expected value) is a term you'll see thrown around a lot when you start hitting the casino offers. There are plenty of offers out there, some will be +ev (profitable) and some -ev (not profitable). It's fairly easy to work out what is +ev and therefore what offers you should be attempting - simply use this equation. You know how much the casino bonus is and how much wagering is required by looking at the offer terms, so the only thing left to understand is the House Edge. House edge in laymans terms means "how much edge the casino has over us", which can vary depending on which game you play. Obviously the odds are always in the casino's favour and so they have a slight edge on every game, but some more so than others. The three most popular games are Blackjack, Roulette and Slots. Below is an average list of the edge. As you can see from the table Blackjack has the lowest house edge and so is the best game to play whenever available, followed by roulette, and then slots. Slots isn't actually 5% as there are loads of different types; some have a 2% edge, some 5%, some even 10%, so we've just written 95% as an average. You'll notice underneath each house edge is a number followed by "RTP". RTP just means return to player. For every bet you place, this is the amount of your stake you'll receive back in theory. So if you were to place a £1 bet on blackjack you'd expect to receive 99.5p back every time. If you were to stake £1 on roulette you'd expect to receive 97.5p back every time. And if you were to stake £1 on slots you'd expect to receive 95p back every time. This is of course in theory and the actual amount you'd receive back varies, but as you can see the odds are clearly in the casinos favour. Every £1 spin they are taking 2.5 pence from you; it doesn't take a genius to work out that the casinos will make money in the long run here! To work out the house edge that you need for the EV calculation, it's simply 100% - RTP. So if the RTP of a slot is 92% then the houses' edge is 8%. 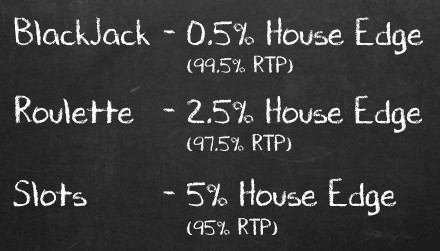 If you're playing roulette and getting an RTP of 97.5% then the houses' edge is 2.5%. Put the numbers into the equation and if it comes out with a positive number then it's +ev and perhaps worth doing! There's an example of a +ev offer below in the Low Risk offers. Low Risk offers are the most common offer from the bookmakers. They'll normally require you to wager around £10 or £20 in order to unlock a bonus or free spins. Although you are wagering £10 or £20, you're not necessarily going to lose that amount because, as explained above, each slot has an rtp of around 95% so you'd expect to lose between 50p and £1. That's why these offers are classed as low risk as they don't require you to wager a HUGE amount, and the risk can be lowered even further by doing small spins such as 20p or 25p to balance out the variance. Lets look at an actual example: An offer is 'Wager £10 Get £5 free'. How much are you going to lose on average doing this, and more importantly what is the ev of this offer? The low risk offers aren't completely risk free and it is possible for some people to go on a "losing streak". Because of this we suggest that you have a certain amount of money, just incase. You should normally be able to complete £10 or £20 wagering without losing much but occasionally you may find that you've had a bit of a down swing. As a general guideline, you should have a bankroll of at least 500 spins for these low risk offers. So we suggest that you have around £100 set aside to complete these offers, so long as you are doing 20p spins to complete these offers. You should never need to dip that much into it and will hopefully start profiting straight away, however for the worst case scenario it's best to have this amount. High Risk casino offers are popular with some of the dedicated casino sites and big bookies. They are often deposit bonuses with high wagering requirements that must be met before you can withdraw any winnings. An example might be '100% matched up to £50' with 40x wagering. This means if you deposit £50, the casino will match this with a £50 bonus. However, you can only withdraw the bonus and any winnings once you meet the wagering requirement which is £4000 (the deposit + bonus multiplied by 40). These offers are labelled high risk as the bust out rate is pretty high. You will lose your deposit around 85% of the time due to the large wagering requirements. For this reason we'd recommend that you have around 100 buy ins before attempting as the swings can be massive. If you're doing deposit £50 offers then it'd mean you should have around £5000 available for the high risk casino offers. Are The Offers Actually Profitable? Yes they are! There's lots of things to bear in mind though such as which slots to choose, what's the max stake, and how to deal with downswings. We'd highly recommend you check out Oddsmonkey's Forum for help in completing these kind of offers as there are some members that make a very decent income from them! These offers run pretty much every day and usually at least one bookmaker will be running a low risk casino offer! The high risk ones are generally harder to find, but if you sign up to most casinos you will constantly be getting reload offers from them that you can profit from in the long run. You can see these in the OddsMonkey Calendar or in the Latest Offers forum. These offers are worth £40 profit/week or £150/month. Tip: Sort the OddsMonkey Calendar by 'Highest Profit' so you always see the most profitable low risk casino offers! The OddsMonkey Casino Offers No Chat thread and Casino Offers Chat thread are both excellent, well worth subscribing to the No Chat thread! 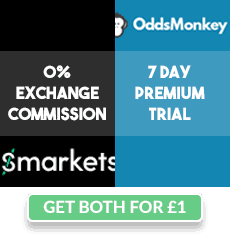 Get Your £1 Oddsmonkey Premium Trial Here! Variance - You will not win every offer. You will win some and lose some. This is called variance, and over time it will average out. Don't let a losing streak get to you, be disciplined and you'll be fine. RTP - Return to player. This is how much of your stake will theoretically be returned to you each spin/hand on the specific game. I.e. £1 stake on a 95% slot will return 95p on average. You want this number as high as possible. House Edge - The edge the casino has. To put it simply it's the opposite of RTP. If a slot has 95% RTP, the house edge is 5%. If the slot has 90% RTP, the house edge is 10%. If the slot has 50% RTP, the house edge is 50%. You want this number as low as possible. Wagering - This is the amount you have to bet in total for the offer. You don't have to bet it all in one go, wagering is simply the overall amount you need to bet or spin. EV - Estimated Value. This is the estimated amount of money you will make from the offer in the long run. If you had an offer with +£5 EV then over 100 offers you'd expect to have made £500. Remember this number is an estimate and is not guaranteed - however the theory is that over such a big sample size the amount will be correct. [email protected]t.com - We try to respond to all emails within 24 hours with complete answers.